The Engine Revolution: Free is the New Paid. I remember when I was a doe eyed teenager thinking that it would be great to make games (I know better now, of course) if I could only afford the fees to get a good engine. You see back then commercial engines were licensed for inordinate sums of money and the technical hurdle of building your own engine was fraught with danger. Over time though that has changed with old engines being open sourced, new products entering the fray and licensing models shifting to be more palatable to those who might not be able to afford huge upfront costs. Today it seems that free is now the way to go as 3 major platforms have just announced that their engines are free for all who want them, opening up a wealth of possibilities to indies and big development houses alike. Unity has been the mainstay of many indie games for quite a while now, enabling many to create games that would’ve otherwise been impossible. They’ve also long been sympathetic to the cause, offering free (but often cut down) versions of their engine to anyone who’d ask for them. The difference between the free and paid tier has been eroded completely with both versions containing all the same features and editor. This is a big step for Unity as there was a definite rift between the paid and free versions, something that was abundantly clear to me when I was tinkering around with it. Now the difference between the tiers comes in the form of additional services and can be had for a measly $1500 (which includes a team license) or $75/month if that’s too rich for your blood. Suffice to say that I think Unity is likely to remain the king of indie engines for a long time now as even the pro tier is well within the grasp of aspiring devs. Not to be outdone by Unity Unreal announced on the same day that their new Unreal 4 engine, which has had some incredibly impressive demos, is now free to any and all comers.The barrier to entry wasn’t particularly high before, they only charged $19 to get access to the engine and all its source, however that’s enough to stop some people from considering it in the first place. Now you’ll be able to get it everything that program gave you for free and you won’t have to pay a dime until you’re able. The limit on revenue isn’t particularly high though, only $3000 per product per quarter, before you have to shell out 5% of gross revenue something which could be a killer for some devs. Still it’s hard to deny what the engine is capable of producing so it might be an easier sell for more established dev houses. Lastly Valve has swaggered into the picture debuting their new Source 2 engine and announcing that it will also be free to anyone who wants it. It’s been not-so-secretly released as part of the DOTA 2 development tools for the better part of a year now and by all accounts seems like a really capable next-gen engine. Source 2 appears to be the most “free” of the free engines that have debuted in the past couple days with Valve wanting no money up front for the engine nor any backend revenue should you make it big. However there is the caveat that the resulting game be released on Steam which means all sales on there give Valve their 30% cut although you’d incur this same cost regardless of which engine you used if you sold on Steam. Source 2 is then something of a loss-leader for future sales, a clever move by Valve to bring more developers onto their platform (as if there wasn’t enough already). With this many options available now developers are now spoiled for choice when it comes to selecting an engine for a game, something you really couldn’t say even a few years ago. Whilst I think Unreal will probably be the least likely one to be used out of the current 3 I think there’s going to be some stiff competition between Unity and Source 2 as time goes on. Unity has the head start in this regard as their tools really are top notch for both novice and advanced developers alike but Source 2 has the potential to turn into something amazing based on the community that Valve seems to develop around every one of its products. The real winner in all of this is us, the gaming public, as it means more games will get made and more concepts will be explored. So the gear heads among you will probably be aware of things like VTEC and VVT-i which have been the standard way to give cars good fuel economy at the low end whilst also allowing them to achieve better acceleration and top speed. The Free Valve technology is like the next step in that technology allowing you to have almost limitless numbers of valve profiles. Additionally the response curve of the valves is very different to what you’d traditionally see, something which I didn’t think would provide any benefit. As the video dives into though you can see that there’s numerous advantages to this type of valve control system. Showing it running on a production model Saab was quite impressive too as it shows that it wasn’t just a concept technology that would never see the real world. What really got me though was the Free Valves ability to hook up to a compressed air tank. It’s akin to the regenerative braking systems that electric and hybrid vehicles employ today except this one works on cars that don’t use electric propulsion. It’s a powerful idea for a couple reasons, most notably that you could use this to overcome the most inefficient periods of an internal combustion engine, namely acceleration and idle. Of course there’s also the flip side of it being used to make high performance cars even faster something which I’m sure will make its way into the next generation Koenigsegg supercars. I’m still an advocate for an all electric future, at least for consumer level transportation, but technology like this is still incredibly useful for where electric simply doesn’t make sense. Hopefully this tech will make its way down to production cars sooner rather than later as even if those savings are only half what they claim they are that’s still an incredible amount of greenhouse gasses not entering the atmosphere. Plus I’m sure everyone would be welcoming of cars that use less fuel but provide more power as I know I certainly would. I have a lot of respect for fine engineering. It doesn’t matter what field it comes from either as I find there’s an elegance about things that have been so well planned, designed and the implemented. I recently came across this video that show cases the world’s smallest V12 engine, all hand made (apart from the screws). It’s a bit lengthy but I was mesmerized by it, loving the incredible attention to detail and the beauty of something so complex coming together so well. I think it also plays into my not-so-secret love of steampunk stuff, what with all the elaborate metalwork and interconnecting parts. Rage: A Beautiful Tech Demo. It’s hard to believe that it’s been a good 7 years since we saw a release from the famous id Software developers. For a company that had regular releases every 2 to 3 years for almost 2 decades prior the silence from them was rather unusual, sparking rumours that they were in a Duke Nukem Forever situation. Still their tech demos of the new id Tech 5 engine that was powering their next game showed that they were making progress and that has culminated in their next game release: Rage. After a good 12 hours or so with it over the past couple weeks I’m in two minds about id’s latest game, or more aptly their latest engine. Rage puts you about 130 odd years into the future into a post apocalyptic world that’s been ravaged by the 99942 Apophis. Now the space nerds amongst us will recognise that that is a very real asteroid and whilst we’ve since eliminated the prospect of it hitting earth in 2029 as the game predicts it was none the less a gripping hook to get me into the story. You play as Daniel Tosh, one of the chosen few to be buried in a capsule with other survivors in cryogenic suspension, only to wake a century after the impact has occured in order to rebuild humanity. When you wake however you find that the pod malfunctioned and you’re the only survivor out of your particular ark and the world that you’ve come out in is a desolate wasteland. Now Rage has copped a lot of flak for the absurdly broken release that it had on PC and when I first played it I was no exception. There was massive amounts of tearing, models glitching in and out of sight and textures not rendering properly or at the incorrect level of detail. The first patch plus a new round of ATI drivers fixed most of those problems making the game playable but it wasn’t until a friend of mine linked me to this post on the steam forums that Rage actually began to shine. After applying the new config the game was absolutely beautiful, both visually and performance wise with my computer running everything at absolute maximum settings I never had an performance problems. Rage still didn’t like to be alt-tabbed however as that would bring back tearing with mad vengeance. Such problems did not plague the console release however, so their launch day experience was probably much better. 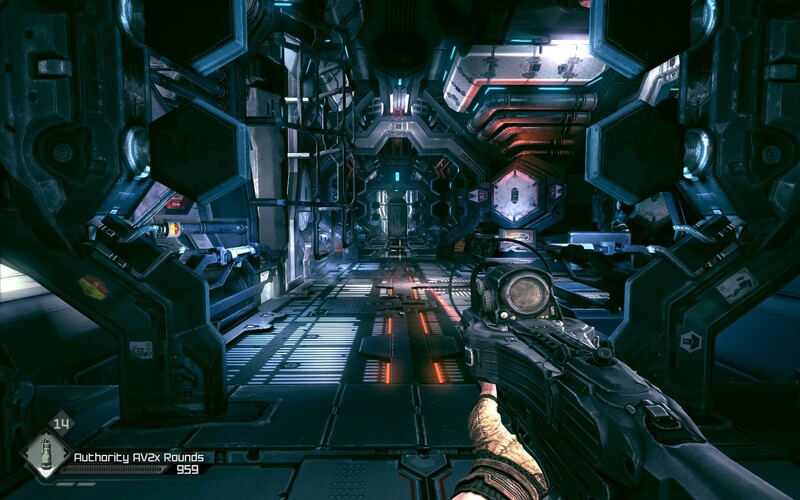 Rage is very much like Borderlands in that it fuses RPG elements with FPS game play. The main story line is driven via quests given to you by various NPC characters and there’s a multitude of side quests that won’t further the plot but will get you things to help you along your journey. There’s no skill trees or levels per say but you will acquire various upgrades that will help to make the game easier. Most of the weapons have some form of upgrade but they’re usually not that useful, especially once you pick up certain weapons like the sniper rifle or the Authority Machine Gun. There’s also a crafting system that allows you to concoct all sorts of interesting things and, thankfully, there’s no limit on the amount of stuff you can carry so you can always have what you need when you need it. 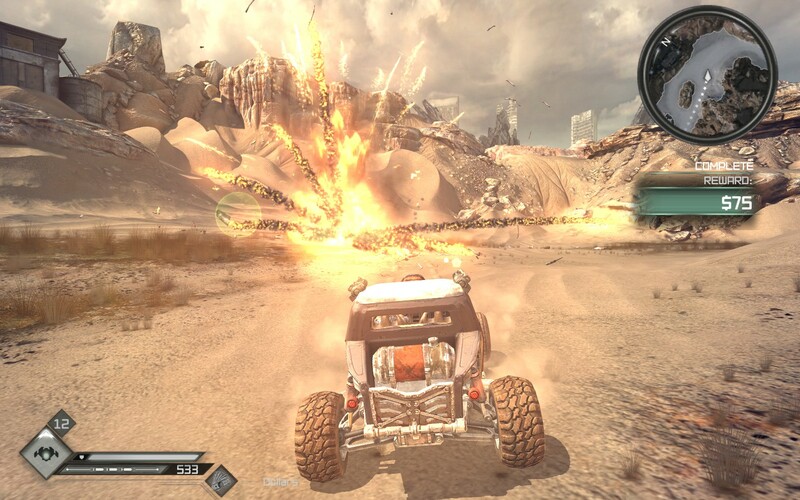 The game play in Rage is divided into 2 distinct categories: the vehicle sections and then your typical FPS run and gun. The vehicle sections, as pictured above, serve as being a break between quests where you’ll be accosted by bandits in the wasteland. There’s also a series of jump challenges scattered around the place for you to attempt, but since they give no reward apart from possibly an achievement there’s no real incentive to go for them. Your vehicle can also be upgraded with “Race Certificates” won from races or given as rewards to quests. Some of these races are fun (like the rocket races, where you get to blow your opponents up) where as others just feel like a chore. I only spent the bare minimum amount of time on the races however as once you’ve got the few key upgrades there’s no incentive to keep doing them. 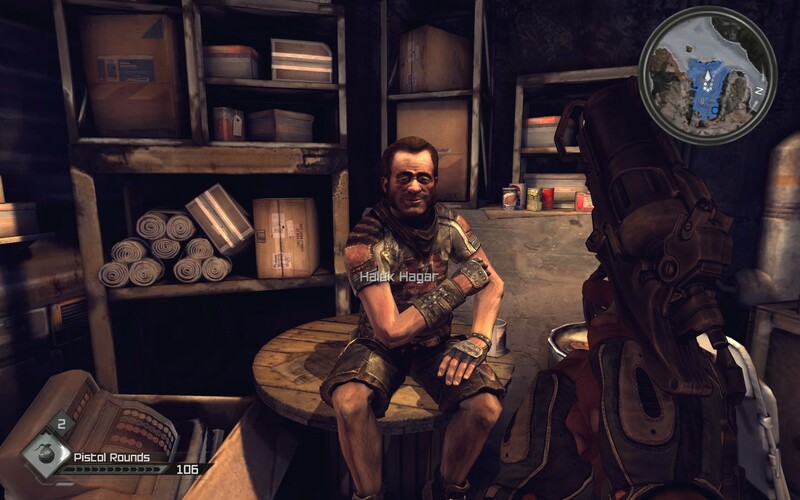 The FPS component of Rage is a pretty typical affair, being a somewhat cover based shooter with the added advantage of you being able to heal and also revive yourself should you end up being overwhelmed. For the most part its quite servicable as you can choose to either strut out into the open and keep yourself healed with bandages (of which you can make an almost unlimited amount of) or pick people off from behind cover. The additional secondary weapons like the wingsticks (basically a bladed boomerang) and sentry bots help to keep the combat interesting and can be the difference between making it through alive or reloading your save for the nth time. There are however a couple glitches in the combat system that need mentioning. If you’re say unloading shell after shell into an enemy whilst they’re doing a particular animation there’s no indication as to whether you’ve killed them or not. This becomes rather irritating when the death animations for some NPCs closely resemble that of them stumbling after taking a big hit, leading you to waste countless rounds in order to just make sure that they’re down. There’s also the fact that headshots, even with the sniper rifle, don’t usually one shot enemies like they usually do. This isn’t a glitch per say more of an annoyance as that one carefully lined up shot has to be two carefully lined up shots which you don’t usually have the luxury of taking. The story that had such a gripping hook at the start is unfortunately quite thin on the ground with your character’s motivations for doing what he’s doing coming from other people telling him what to do constantly. Although the world is meant to feel open ended the story, and all of the missions, are completely linear with no real options for going at something another way. Rage’s storyline also suffers from major pacing problems as well, especially towards the end when you’re suddenly plonked onto the final mission with little more notice than the title of the mission indicating that it might be a one way trip. The end boss fight, if you could call it that, also pales in comparison to some of the other boss fights in the game leaving you feel like you’ve missed something along the way. Ultimately the intial hook that got me in was the pinnacle of the storytelling in Rage and that’s very disappointing. Rage has its moments as a game but ultimately it feels more like a 12 hour tech demo than it does a fully fledged game that took 7 years to build. I would usually let id off the hook on this one since they’d be licensing their engine (which is a technical marvel) and thus the game wasn’t their main focus but outside of Zenimax companies (id’s parent company) the id Tech 5 engine won’t be available for licensing. 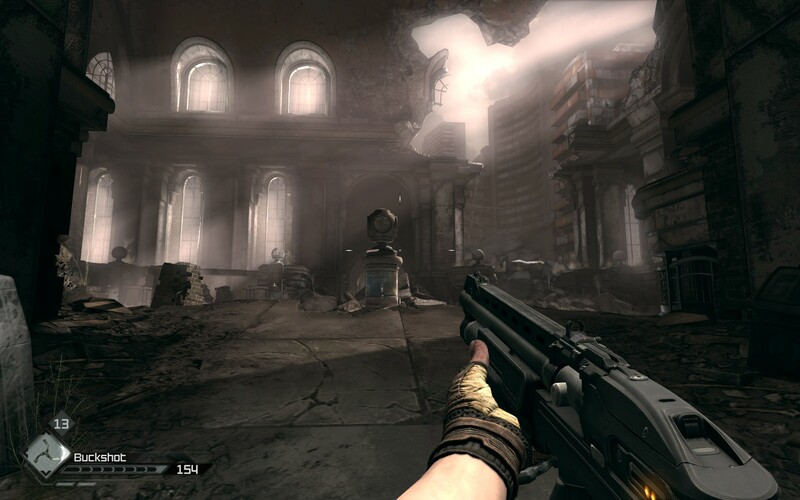 Thus for the foreseeable future the only 2 games that will use this engine will be Rage and Doom 4, which is a shame because once it’s set up right it’s quite spectacular. Rage then as a game is a FPS/RPG hybrid that manages to deliver sometimes but suffers from multiple problems that detract from the technical beauty that it contains. Rage is available on PC, Xbox360 and PlayStation 3 right now for $108, $108 and $88 respectively. Game was played entirely on the PC with around 12 hours of total play time and 46% of the achievements unlocked. Could Skylon Be The First Single Stage to Orbit Craft? 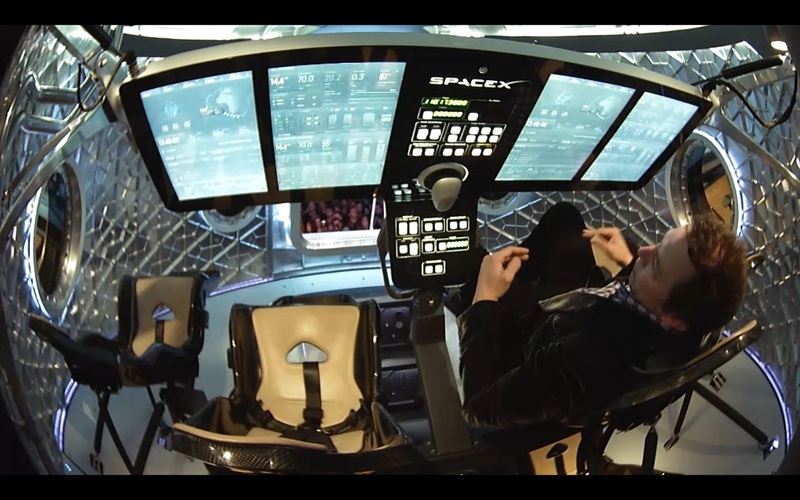 The current way of accessing space isn’t sustainable if we want to make it as a space fairing species. Whilst the methods we use today are proven and extremely reliable they are amongst the most inefficient ways of lifting payload into orbit around our planet, requiring craft that are orders of magnitude larger than the precious cargo they carry. Unfortunately the alternatives haven’t been too forthcoming, due in part to nuclear technologies being extremely taboo and the others still being highly theoretical. Still even highly theoretical ideas can have a lot of merit especially if they have smaller aspects that can be tested and verified independently, giving the overall theory some legs to stand on. I’ve talked before about the idea of creating a craft that uses only a single stage to orbit (SSTO), in essence a craft that has only one complete stage and conceivably makes extensive use of traditional aerodynamic principles to do away with a lot of the weight that conventional rockets have. My proposal relied on two tested technologies, the scramjet and aerospike engine, that would form the basis of a craft that would be the Model T equivalent for space travel; in essence opening up space access to anyone who wanted it. In all honesty such a craft seeing reality is a long way off but that doesn’t mean people aren’t investigating the idea of building a SSTO craft using different technologies. They want the next phase of development to include a ground demonstration of its key innovation – its Sabre engine. This power unit is designed to breathe oxygen from the air in the early phases of flight – just like jet engines – before switching to full rocket mode as the Skylon vehicle climbs out of the atmosphere. It is the spaceplane’s “single-stage-to-orbit” operation and its re-usability that makes Skylon such an enticing prospect and one that could substantially reduce the cost of space activity, say its proponents. The engine they’re proposing, called Sabre, has an extremely interesting design. At lower speeds it functions much like a normal jet engine however as speeds approach Mach 5, the point at which my hand waving design would switch to a scramjet, it continues to operate in much the same fashion. They do however employ a very exotic cooling system so that the engine doesn’t melt in the 1000+ degree heat that would be blasting the components and once Skylon is out of the atmosphere it switches to a normal rocket engine to finish off the job. The issues I see, that face nearly all SSTO designs, is the rule of 6 for getting to orbit. The rule simply states that at Mach 6 at 60,000 feet you have approximately 6% of the total energy required to make it successfully to orbit. Skylon’s engines operate in the jet mode all the way up to Mach 5 to an altitude of 85,000 feet which is no small feet in itself, but it’s still a far cry from the total energy required. It is true though that the first stages of any rocket are the most inefficient and eliminating them by using the atmosphere for both oxidiser and thrust could prove to be a real boon for delivering payloads into orbit. Still whether this will be practical with Skylon and the Sabre engine remains to be seen but there are tests scheduled for the not too distant future.